Trials of activists and journalists surrounding protests during the inaugural in January begin this week. Udry is executive director and Gibbons is legislative and policy counsel with the group Defending Rights and Dissent, which put out the recent statement: “Political Expression Is Not A Conspiracy.” The piece states: “The DOJ is turning political expression into conspiracy and free assembly into a crime. “They are using a shocking legal theory: if you attend a march where other individuals engage in vandalism you are collectively liable for their acts and should face decades in prison. 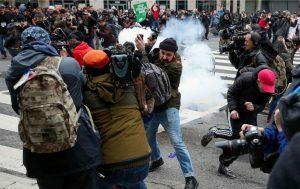 Ditto if you’re a journalist who is merely covering the event.” Gibbons recently wrote the piece “The Prosecution of Inauguration-Day Protesters Is a Threat to Dissent” for The Nation.